Sick of buying action figures? Don't like what others design? You could always make customized figures from bits and bobs of other toys as well as your own elbow grease. Or, you know, you could just print them out. Two things: One, 3D printers are not new, and two, they are not usually affordable. 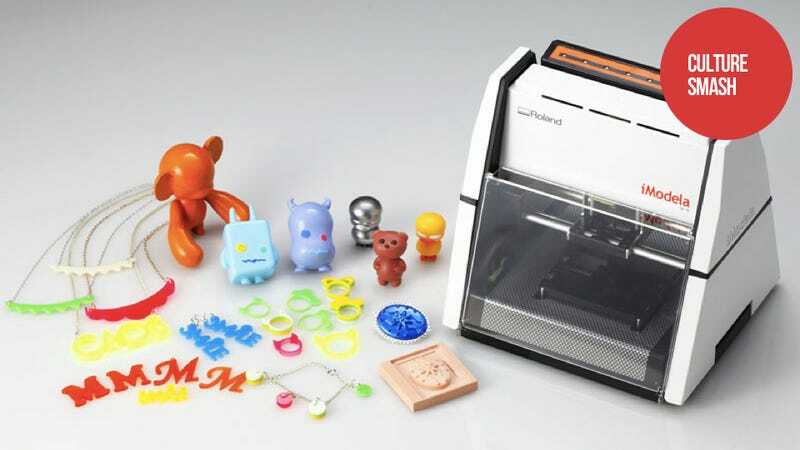 Japan-based industrial company Roland DG is changing that with the iModela iM-01, a desktop 3D printer. Well, sort of. According to Roland, the iModela can mill wax, foam, balsa wood, and plastic via PC software that allows you to design original 3D models or download them. The puppy connects to your PC via USB. The iModela is the latest in a string of products—like 3D CG model Quma—which are aimed at armchair creative types. If Kinect Were an Action Figure, It Would Be This. "iModela makes it easy to create a physical model from an artist's 3D rendering, using powerful 3D modeling technology to sculpt shapes, drill holes, create reliefs, smooth surfaces and engrave designs," added Sugiyama. "With iModela, 3D modelers and hobbyists can affordably produce even the most complex designs with precision." By affordable, Roland meant ¥75,000, which at the current strong yen exchange rate is US$977. Nine hundred bucks is nine hundred bucks, and that's a lot of money. However, it does come in under other "cheap" 3D printers like China's UP! personal 3D printer, which retails at $1,500. Remember, larger industrial scale 3D printers can cost thousands—tens of thousands, because these printers don't just make stuff. They run on pixie dust, because they are magic. Now, instead of commissioning that a personalized action figure, you can make it yourself on a desktop and print it out. Progress!